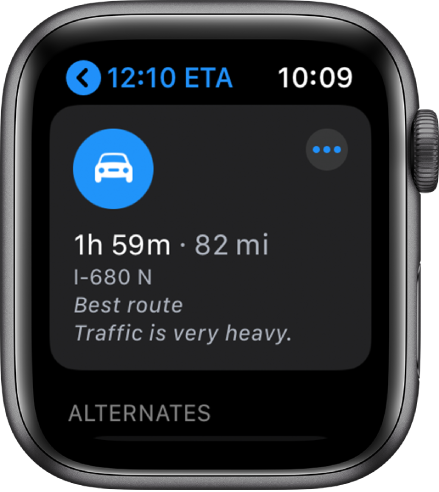 Open the Maps app on your Apple Watch. Turn the Digital Crown to scroll to Suggestions, Recents, and Favorites. Tap an entry to get driving directions. Tap to see an overview of your trip—with turns, distance between turns, and street names. After you head off on your first leg, your Apple Watch uses sounds and taps to let you know when to turn. A low tone followed by a high tone (tock tick, tock tick) means turn right at the intersection you’re approaching; a high tone followed by a low tone (tick tock, tick tock) means turn left. Not sure what your destination looks like? You’ll feel a vibration when you’re on the last leg, and again when you arrive. To end directions before you get there, firmly press the display, then tap End. Tip: As with other directions, you may see alternate routes, each with a travel time estimate and distance. Turn the Digital Crown to view the routes, then tap the one you want to take. Tap My Watch, then tap Maps. Turn on the alerts you want to receive—Driving, Driving with CarPlay, and Walking. Tap Location, then tap the destination landmark or map pin. Scroll the location information until you see Directions, then tap Walking, Driving, or Transit (if available). When you’re ready to go, tap a route, then follow the directions. Look in the top-left corner to see your estimated arrival time. To see the estimated duration of your journey once it’s begun, tap the estimated time of arrival. 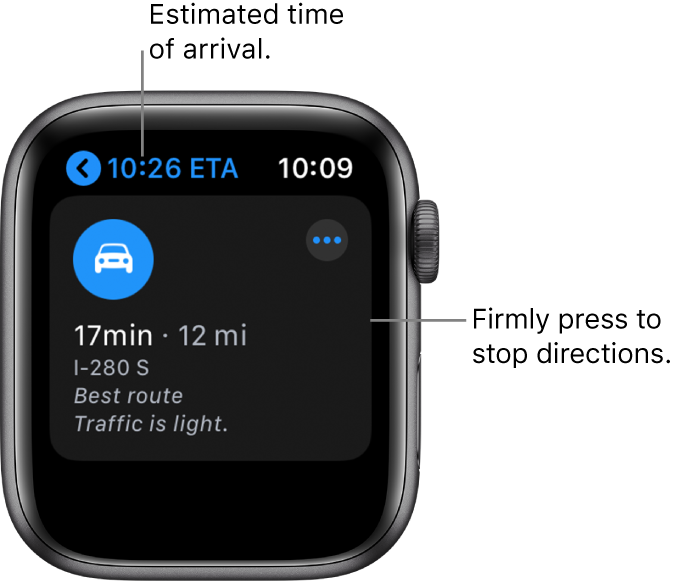 You can switch to the watch face while you’re getting directions. To quickly return to Maps, tap at the top of the screen. 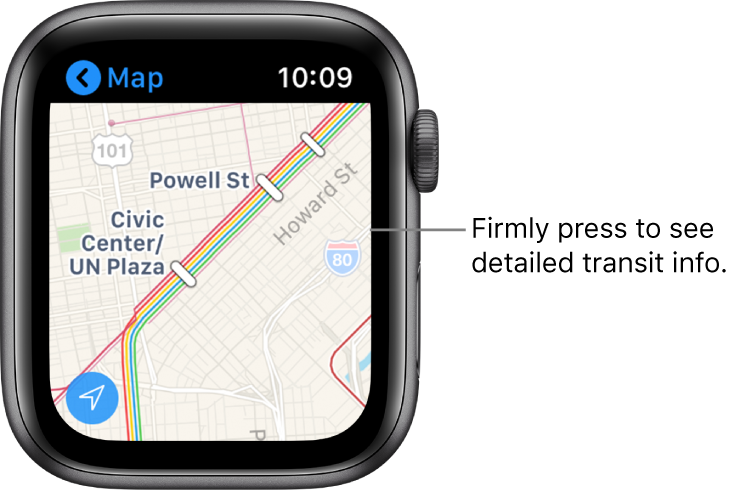 While viewing the map, firmly press the display, then tap Transit Map to see bus and train stops and schedules—even detailed station information for some cities. To turn off transit details, firmly press the display, then tap Standard Map.